Hello to everyone at the Pearson's yacht club. Four months ago I bought hull #12, formerly The Sparrow. I'm four months into a one-year rehab that I hope won't take three. So far, I've ripped out all the plumbing, taken out the alcohol stove, complete bottom job, topside paint, and new electronics. I found this site to be very informative before I was a member, and more so now that I am a member. I have two questions relevant to work I'm currently or planning to do, and I look forward to hearing your advice. 1. I plan to upgrade all the original electronics; leaning toward RayMarine. Reading through the posts, some people love RayMarine, others hate it. The existing autopilot was a Benmar Course Setter 21. It had a chain-driven motor mounted directly to the steering. I plan to use the RayMarine chain-driven unit and mount it in the same place it was originally. Is this a wise move? 2. For the head, I plan to install a Raritan PHII electric, very similar to the original one. It flows to a Y-valve, where waste goes directly overboard in front of the starboard water tank or switches to a flexible holding tank (brand new) that was mounted under the cabin floor in the center of the boat, where it goes back up to a macerator pump and gets discharged. I know this system isn't legal for today's boat, I was wondering if it'd be okay to put it back exactly as it was under a grandfather clause. Welcome aboard and congratulations on your "new" P365. I like the name Sparrow by the way. Electrical schematic drawings - I am not aware of anything on this site but Garner will have it for sure. 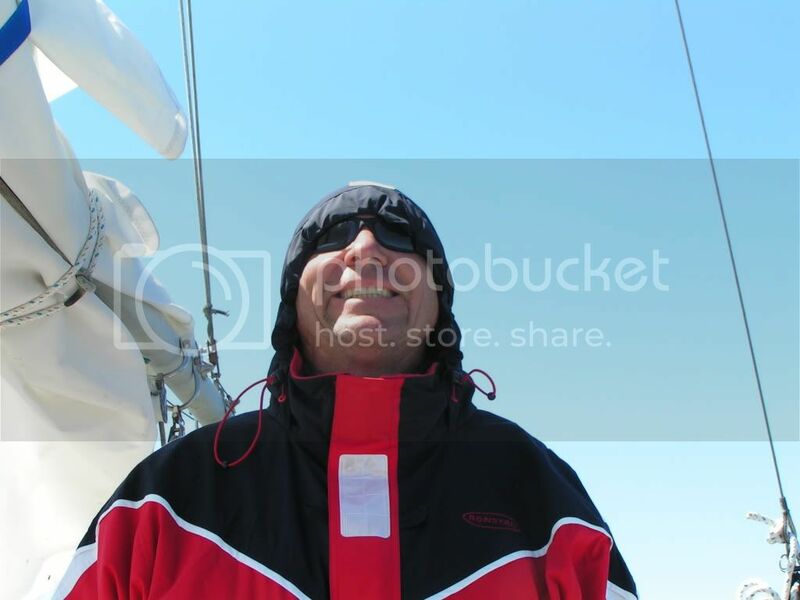 His website for his boat is - http://www.sailingseadragon.com I would look under manuals and I am sure you will find what you are looking for. That being said a lot of water has gone under the keel of hull #12 so don't expect your electrical system to match the factory... which is probably a good thing. Autopilot - I am assuming we are talking wheel pilots. We have the Simrad W32 wheelpilot and it does the job for what we do with the boat but be aware that any wheel mounted autopilot are typically light duty units. If you are going off shore an under deck unit would be the most advisable. That being said, we use the wheel pilot under 15 kts, typically not off the wind, and for sure if we are motoring any distance. For the most part "Steve" as we refer to it is a lifesaver for going below for a sandwich or a jacket and holding a course when setting sail and putting them away. You will find that if the sailplan is balanced and the wheel brake is snugged up, a 365 will sail forever and forever with out need for any attention. Head - I am of the mind to act now and beg forgiveness latter. I would assume you would only be discharging overboard well off shore and only when absolutely necessary. Hi Dale, Thank you for your response. I have been reading your posts since I acquired the boat; I have found them most informative. I look forward to picking your brain as I go through the rehab process. I have heard these boats are great to sail; I can't wait to get her in water. We like the name Sparrow too, but I wanted name her after my mother, Patricia. Hello! I am a new member of the club. I am very pleased to join the community of owners Pearson 365. My yacht is called "Good Karma" flag of Ukraine. In September 2013 I bought a yacht in Guatemala Rio Dulce. Solo went to Honduras Roatan Island Mexico Muheras then then then Key West Fort Loderdel. There now is my yacht. Since the war began in Ukraine I had to leave the boat and come home. I want to say about the boat experience. I have experience of traveling under sail 16years. I went to many yachts. Think. this yacht Pearson 365 is one of the best yacht for use by one or two people. Great stability, good comfort. I never would not sell it if it were not for the war. But if there is no buyer until October, I'll be on a yacht in Fort Loderdel and continue the journey. Though I am not (yet) a 365 owner, I appreciate the opportunity to join this forum/club. My current ride is a Cape Dory 25D, and I thought the Cape Dory boards were good, but from what I've seen so far, this one blows those away with the amount of knowledge and experience specific to these boats. I am currently looking for a 365 ketch as an upcoming retirement gift to myself, so if anyone knows of one on the east coast, preferably the northeast, that hasn't shown up yet on Yachtworld, please message me. I'm a firm believer that "...there is nothing - absolutely nothing - half so much worth doing as simply messing about in boats", so I'm not afraid of most projects, but I'd also like to be able to sail the boat without a necessary 2 year refit first. Until I find myself a 365 to mess about in, I'll keep reading and learning from you all. Thanks so much! Hi, My name is Ed Hart aka, Hooligan I am in the process of buying a Pearson 367 Cutter. I have owned 15 sailboats. Always looking for a better one and I think will be the best one yet. Welcome Ed. I am a new 365 owner too-a sloop that I have been slowly refitting and sailing (this is my first season). Lots of knowledge on the boards and folks are alway willing to chime in. This is my second sailboat and I can tell you, its much more comfortable than my 1966 Pearson Vanguard. That said, its a lobster pot magnet-get yourself a line cutter if you are sailing anywhere near traps. What do you have for an engine? Hi, Thanks for the info. Yes I will be sailing in the Chesapeke and the ICW so there are lot's of pots. My engine is the Universal 5444. I purchased the Nightwind last year. She is a 1983 36' 367 Hull#49, which from what I can tell is the last 367 hull manufactured in 1983. She is my life-a-board in Ventura Ca. I would love to post a picture but...not sure how on this site. Maybe after I snoop around some more. From what I have been told by other Pearson owners, when she left the manufacture they had installed and designed all the available options, including the aft quarter berth. The pervious owners must have been fanatics about the maintenance and upkeep because there is and was nothing to do on this beauty! Enough bragging....so glad to have found this site and would really enjoy meeting more Pearson owners out this way.